In this photo taken and released Friday by the Taiwan Ministry of National Defense, a Taiwanese Air Force fighter aircraft (left) flies near a Chinese People's Liberation Army Air Force bomber. Taiwanese President Tsai Ing-wen said this week that the island will step up security to respond to military threats from China. 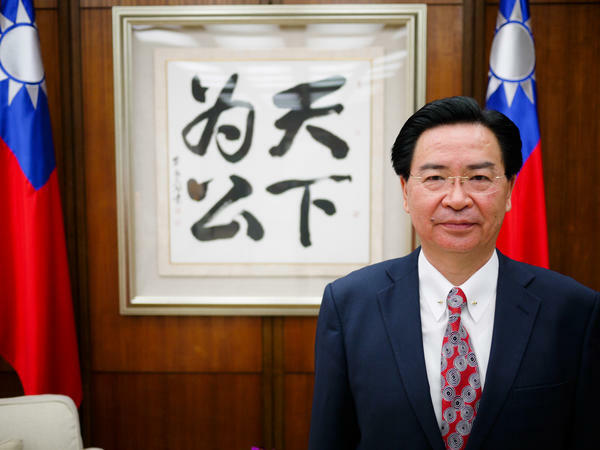 Taiwanese Foreign Minister Joseph Wu told NPR that "every other country has the right to enter into diplomatic relations with other countries," but that Taiwan's situation is different because "it is being blocked by China to do all those things." Experts say that China could turn to military force to reunite with Taiwan in the next few decades, painting an upsetting picture of an attack on the capital, Taipei City. Former Taiwanese Deputy Defense Minister Chong-pin Lin says China's leaders would prefer to use diplomacy, psychological warfare and economic influence to gradually unify Taiwan with mainland China. It's not easy being in charge of foreign relations of a country most of the world refuses to recognize. Taiwan lost another ally on Thursday. The West African country Burkina Faso became the latest country to cut ties with the island. After the Dominican Republic, that's two in less than one month. And like other countries, including the United States, that for decades have broken diplomatic relations with Taiwan, they did so for one reason: to please China. The Chinese government refuses to maintain diplomatic relations with any nation that recognizes Taiwan and has long pressured countries to sever ties with the island. For Taiwanese Foreign Minister Joseph Wu, it's hard not to feel cornered. "When we look at the rest of the world, every other country has the right to enter into diplomatic relations with other countries," Wu says in an NPR interview. "They have every right to participate in international activities or international organizations. But Taiwan is in a situation that it is being blocked by China to do all those things." Despite the fact that Taiwan has its own democratically elected government, its own military and its own flag, the Chinese government regards the island as a renegade province that belongs to China. Today, fewer than 20 countries have formal ties with the island, down from about 30 in the 1990s. Yet while China has long used diplomatic and commercial might to isolate Taiwan, it has also recently displayed its military strategy. Last month, China conducted a live-fire drill in the Taiwan Strait for the first time in two years. That was soon followed by bombers, surveillance aircraft and fighter jets from China's air force that have been circling Taiwan on a semiregular basis in recent weeks. China's Taiwan Affairs Office spokesman Ma Xiaoguang was quoted by the Global Times tabloid as saying the purpose of the drills was "to reaffirm that we have strong determination, confidence and capability to destroy any type of 'Taiwan independence' scheme in order to safeguard the country's sovereignty and territorial integrity." But military experts offer different takes on what it may mean: Some view the drills as routine exercises, but others say this could be a glimpse of future plans for invasion. Taiwanese President Tsai Ing-wen was angered by China's latest moves, including its poaching of Burkina Faso, one of Taiwan's last allies in Africa and the fourth country to ditch Taiwan since the president took office in 2016. "The series of outrageous maneuvers from China intended to diminish Taiwan's sovereignty has crossed a red line for Taiwanese society," Tsai told reporters. 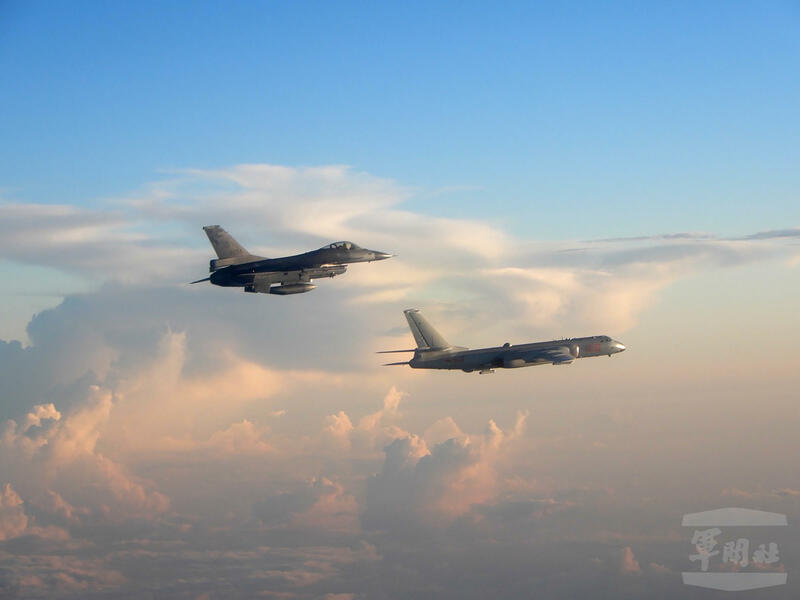 On Friday, Taiwan's Defense Ministry said it dispatched fighter jets to shadow Chinese bombers carrying out a drill around Taiwan. Capt. James Fanell, a former deputy intelligence head for the U.S. Navy's Pacific Fleet, says none of Beijing's military displays surprise him. "The things that I was seeing in the classified world and the things that I saw in my job all indicated that timelines had been given to the People's Liberation Army to be prepared to have the capacity to take Taiwan by military force if need be starting in 2020," says Fanell. Beijing's goal is to ensure that Taiwan is unified with China by 2049, the centennial of what the Communist Party calls its liberation of China, Fanell says. "They prefer not to use force," he says, "but they've also planned to use force and they bought and purchased and developed military capability to use just in case the nonviolent means doesn't work." Fanell, who is now a fellow at the Geneva Centre for Security Policy, believes China will try to take Taiwan peacefully over the next decade, using economic incentives and pressure. If that doesn't work, he believes a military invasion is likely by 2030. "If you can mentally take pictures of what we've seen in Syria in recent weeks, with towns destroyed by missile strikes, think about that in a place like Taipei," Fanell says of a potential Chinese attack on Taiwan's capital city. But Taiwan's former deputy defense minister, Chong-pin Lin, disagrees that China would launch such an aggressive military attack of Taiwan. 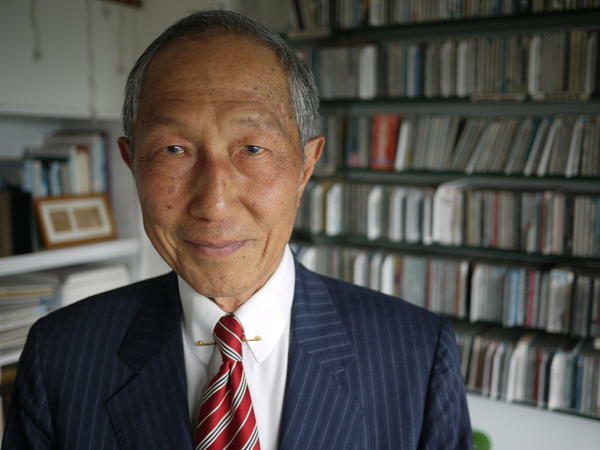 "If Beijing really wants to use military options, it would be a war of paralysis," says Lin. If it attacks Taiwan at all, Lin predicts Beijing would more likely use electromagnetic pulse weaponry — much of it currently believed to be in a prototype stage in China — that emits bursts that disrupt computers, Internet signals and radio communications. Yet Lin questions the need for Beijing to take Taiwan in this manner. China's leaders would prefer to use diplomacy, psychological warfare and economic influence to gradually unify Taiwan with mainland China, he says. In a speech in March, Chinese leader Xi Jinping said it is the "shared aspiration of all Chinese people" to realize China's complete reunification, threatening those who tried to stand in the way with the "punishment of history." But it was what happened right before this speech — the elimination of presidential term limits for Xi — that gives Taiwanese Foreign Minister Wu a clue that invading Taiwan may not be high on the leader's agenda. "What we see is that Xi Jinping seems to be accumulating more and more power for himself," Wu observes, "and it reflects just one thing: that is that he doesn't have enough sense of security." Wu thinks Xi's power grab shows a leader who is not confident with his control over China's own problems — issues that will distract him from Taiwan. But Wen-Cheng Lin, a former senior adviser to Taiwan's National Security Council, says China is using other ways to pressure Taiwan. "China wants to drain Taiwan's finances and talent," he says. "Taiwanese companies are allowed to be listed in the mainland. 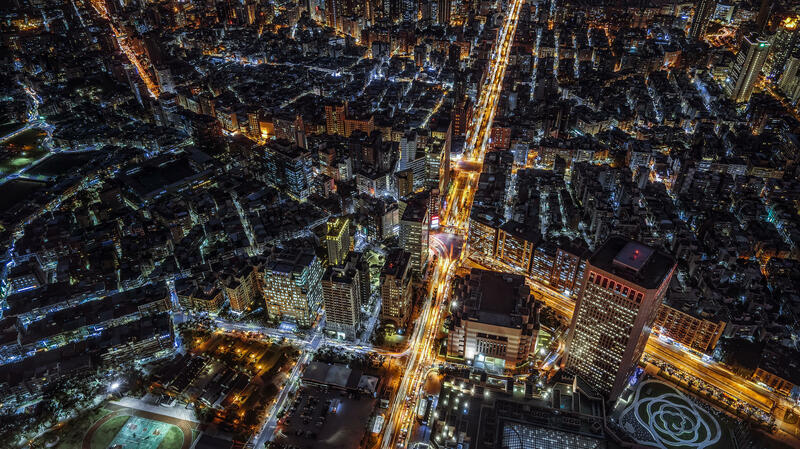 Young Taiwanese talent is encouraged and incentivized to work in the mainland." And China's government has put restrictions on mainland tourists going to Taiwan to put the squeeze on the island, too. At Taipei's popular Palace Museum, a tour guide who only gives her surname, Lai, for fear of retribution for criticizing her government, says Taiwan's tourism industry has tanked since China began putting economic pressure on the island. "Our government has been asking us to learn Thai and Vietnamese to cater to Southeast Asian tourists instead, But these tourists can't boost our economy." Nobody, says Lai, can impact Taiwan's economy like China can. NPR Shanghai bureau assistant Yuhan Xu contributed research to this story. Orwellian nonsense - that is what the Trump administration called China's attempt to make airlines refer to Taiwan only as part of China. Beijing is making this demand despite Taiwan having its own government, its own military, its own flag. NPR's Rob Schmitz reports that China is putting the squeeze on Taiwan in other ways as well. ROB SCHMITZ, BYLINE: It's not easy being in charge of foreign relations in a country most of the world refuses to recognize as a country. But that's the job of Joseph Wu, Taiwan's foreign minister. JOSEPH WU: When we look at the rest of the world, every other country has that right to enter into diplomatic relations with other countries. They have every right to participate in international treaties or international organizations. But Taiwan is in a situation that is being blocked by China to do all those things. SCHMITZ: This means no seat in the U.N., no participation in the World Health Organization. And when the Olympics come around, it has to compete as Chinese Taipei. And then there are the more direct strategies China employs. SCHMITZ: A cinematic soundtrack accompanied Chinese state media reports of Beijing's live-fire drill in the Taiwan Strait in April. Then came Chinese bombers and fighter jets regularly circling Taiwan in recent weeks. Former deputy intelligence head for the U.S. Pacific Fleet James Fanell says none of this surprises him. JAMES FANELL: The things that I was seeing in the classified world and the things that I saw in my job all indicated that timelines had been given to be prepared to have the capacity to take Taiwan by military force, if need be, starting in 2020. SCHMITZ: Beijing's ultimate goal, says Fanell, is to ensure Taiwan is unified with China by 2049, the Centennial of what the Communist Party calls its liberation of China. FANELL: They would prefer not to use force. But they've also planned to use force, and they purchased and developed a military capability to use just in case the nonviolent means doesn't work. SCHMITZ: Fanell believes China will try to take Taiwan peacefully over the next decade using economic incentives and pressure. If that doesn't work, he believes a military invasion is likely. PRESIDENT XI JINPING: (Speaking Chinese). SCHMITZ: In a speech Chinese leader Xi Jinping delivered in March, he said it is the shared aspiration of all Chinese people to realize China's complete reunification, threatening those who tried to stand in the way with the punishment of history. But it was what happened right before this speech, the elimination of term limits for Xi, which gives Taiwanese Foreign Minister Wu a clue that invading Taiwan may not be high on the leader's agenda. WU: What we see is that Xi Jinping seems to be accumulating more and more power for himself. And it reflects just one thing. That is that he doesn't have enough sense of security. SCHMITZ: Wu thinks Xi's power grab shows a leader who is not confident with his control over China's own problems, problems that will distract him from Taiwan. But Wen-cheng Lin, a former senior adviser to Taiwan's National Security Council, says China is using other ways to pressure Taiwan. WEN-CHENG LIN: (Through interpreter) China wants to drain Taiwan's finances and talent. Taiwanese companies are allowed to be listed in the mainland. Taiwanese talent is welcome to work in the mainland. SCHMITZ: And mainland China's tourists, China's government has restricted them to put the squeeze on Taiwan. SCHMITZ: At Taipei's Palace Museum, Taiwan's largest tourist attraction, a tour guide who only gives her surname, Lai, for fear of criticizing her own government, says her industry has tanked since China began putting economic pressure on the island. LAI: (Through interpreter) Our government has been asking us to learn Thai and Vietnamese to cater to South East Asian tourists instead. These tourists can't boost our economy. SCHMITZ: Nobody, says Lai, can impact Taiwan's economy like China can. Rob Schmitz, NPR News, Taipei. (SOUNDBITE OF GOLD PANDA'S "CHIBA DAYS") Transcript provided by NPR, Copyright NPR.